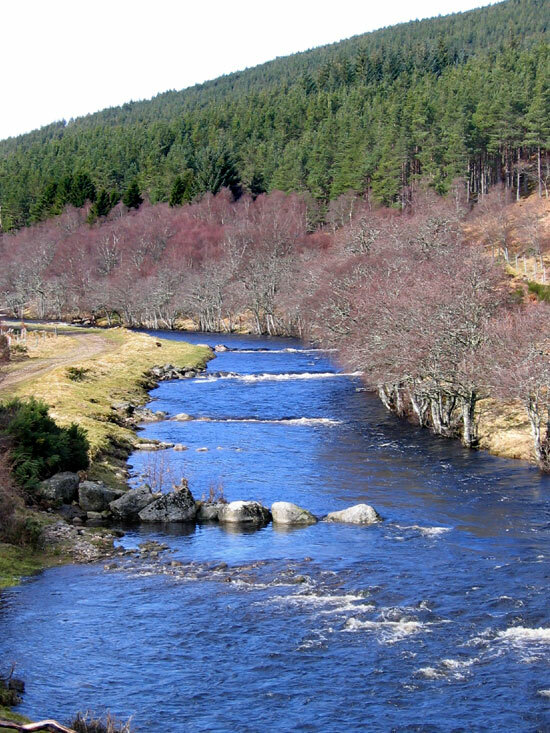 The River Alness, or Averon as it is also known locally, is one of the most picturesque salmon rivers in the Highlands, running for just 11 miles (18km) from Loch Morie into the Cromarty Firth, with a drop of 630ft (192m). The steep descent creates a multitude of fast flowing pools, and a variety of stunning scenery throughout its beats. River Alness Fishings Map - click on it to see a larger version. The salmon fishing on the River Alness is owned or controlled by 4 parties. Novar Estate own the majority of the fishings which are split into 2 different stretches of water, both double-banked. The upper Novar beats start below Loch Morie and extend for about 3 miles (5 km) downstream to the junction with the Blackwater. The lower Novar Fishings start about 2.3 miles further downstream and extend for a further 3.7 miles (6 km) ending just north of the town of Alness. Between the two stretches of river owned by Novar, Kildermorie Estate own about 0.8 miles (1.3 km) of single-bank fishing starting at the Blackwater junction and Ardross Castle Estate own a stretch of about 1.5 miles ( 2.4 km) directly below the Kildermorie waters. 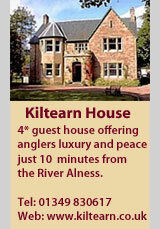 Both estates generally reserve their salmon fishing for estate guests though the Kildermorie water is also accessible to Alness Angling Club members. Alness Angling Club control about 2.1 miles (3.4 km) of fishing directly below the lower Novar beats to the estuary on the Cromarty Firth. Although a spate river, there is a dam, and fish pass, on the outflow from Loch Morie, and flow is regulated to provide compensation levels and occasional freshets. The Novar Fishings and Alness Angling Club beats open for salmon fishing on April 1st. The angling club season closes on October 15th and the Novar Fishings on October 31st. 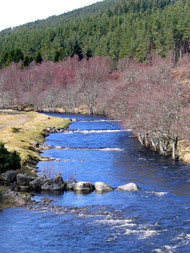 The Alness has a small spring run of salmon from late April until mid June. First grilse usually appear in early July, with the main grilse runs now starting at the end of the month. The most productive part of the season is generally from early August through until the beginning of October. 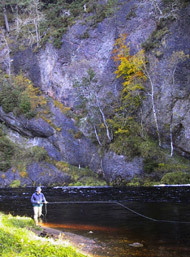 The Alness is a hunter’s river; ‘rivercraft’ and persistence are generally rewarded, and long casting is rarely needed. Fish can be caught by traditional 'down & across' fishing of the main pools, and also on short lines cast into the heads of the pools, and in small runs and pots between the main pools. A 12-13 ft AFTM #8/10 double-handed rod or a 10-12 ft switch rod of similar line weight is suitable for most conditions, though 14-15 ft AFTM 10/11 weight rods can be advantageous in high water. In summer months, great sport can be had with a 10-11 ft single-handed rod, but these should be of a minimum AFTM rating of #7/8. Favourite flies for low water conditions are shrimp patterns such as Ally's Shrimp, Yellow Ally's, Cascade, Stoat's Tail (and variants), Munro Killer, Willie Gunn and Collie Dog (and variants) tied on doubles, as well as small bottle tubes. Towards the end of the season and in higher water conditions, 1" to 2" brass and copper tube flies such as Willie Gunn, Findhorn Killer and Ally's Shrimp are preferred. 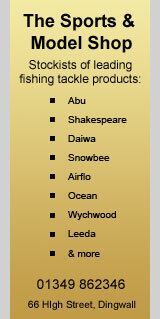 Further information on suggested tackle can be accessed from the menu on the Home page. The River Alness typically produces rod catches of 400-600 salmon & grilse per year of which about two thirds are caught on the Novar waters. The Alness also has reasonable runs of sea trout in summer months offering some exciting night-time fishing.